As I look out my front window, the house across the street plays peek a boo through the swirling snowdrifts — fading in and out of view as the wind throws a fluffy white blanket over the ground. Writing about sailing and cruising seems a little out of context as I begrudge the plow operator for leaving another towering mound snow in my driveway. Winter and sailing in Newfoundland do not play well together. Thinking back a couple of years, I fondly recall one of the many summers spent cruising and exploring the boating paradise that is Bonavista Bay, Newfoundland and Labrador. 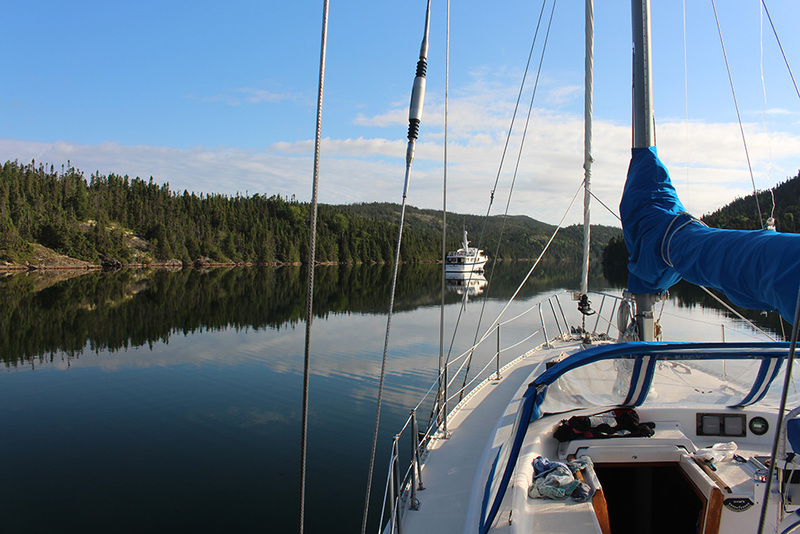 We left our berth at the Royal Newfoundland Yacht Club in early July and lived aboard until returning to Conception Bay in mid-August. According to the log, that year we put over 500 nautical miles under Argonauta’s keel as we poked around the tickles, communities and numerous isolated anchorages that seem to grow in number the more adventurous we become. Pudding Cove, Salvage, The Beaches and Happy Adventure all bring back special memories, but one place stands above the others — the Lion’s Den, Bonavista Bay. Of all the little anchorages we’ve visited, the Lion’s Den holds a charm unlike any other. 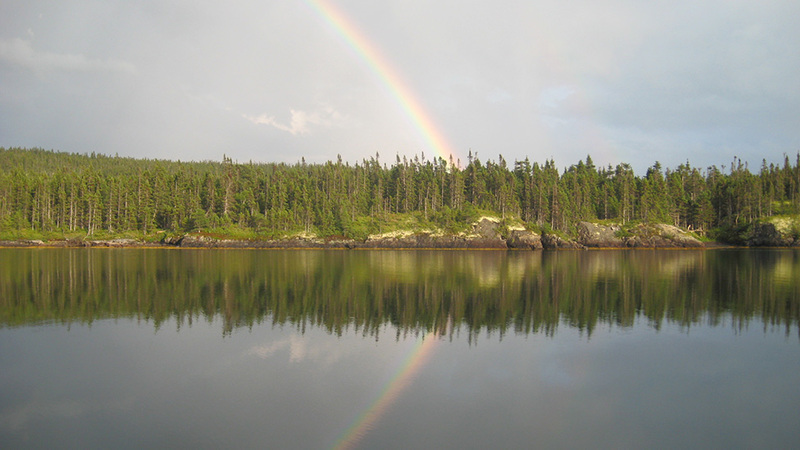 Situated between Chandler’s Reach and Newman Sound, the anchorage is nestled at the far end of a narrow inlet, surrounded by rolling hills and the unspoiled beauty of Terra Nova National Park. Miles away from any hint of civilization, this little cove leaves you feeling like you’ve left it all behind — it’s just you, the boat, nature and no cell phone coverage. Entering the Lion’s Den for the first time is a real treat. Motoring slowly up the inlet on the way to the isolated inner harbour, you’re greeted by steep vertical cliffs on the port side and jagged rocks and reefs to starboard. Stay in the center and you have nothing to worry about, but stray too far to starboard and you may be spending more time here than first intended. It looks intimidating on the chart, but take your time and you’ll be rewarded. A six-foot draft can easily pass but a little local knowledge will help pacify the butterflies somewhat, if not the first time — the next time. Experience is the thing you get right after you need it. Once safely anchored, it’s time to relax and enjoy the spectacular surroundings. At low tide, the golden-brown kelp and seaweed draw your eye to the shoreline and the beach birds hopping about in search of a meal, while the bright sunlight bathing the hillside entices you to look up and drink in the variety of flora and fauna on the neighboring hills. Various shades and hues turn the hillsides into a patchwork quilt of color; dark green spruce, light green fir and brilliant white birch contrast with mottled grey lichen tenaciously clinging to the exposed rock face. Take a healthy deep breath and the intoxicating aroma of the fresh sea air will help cement the memory for later retrieval — perhaps on some blustery winter day. A short dinghy run brings you to a favorite spot we call the bath. A little stream tumbles out of the trees forming a tiny waterfall that empties into a pint-sized pool right on the pebble beach. Although Argonauta has a shower, two in fact, there’s something nice about standing under a small waterfall and lounging naked in a shallow, sun warmed pool. 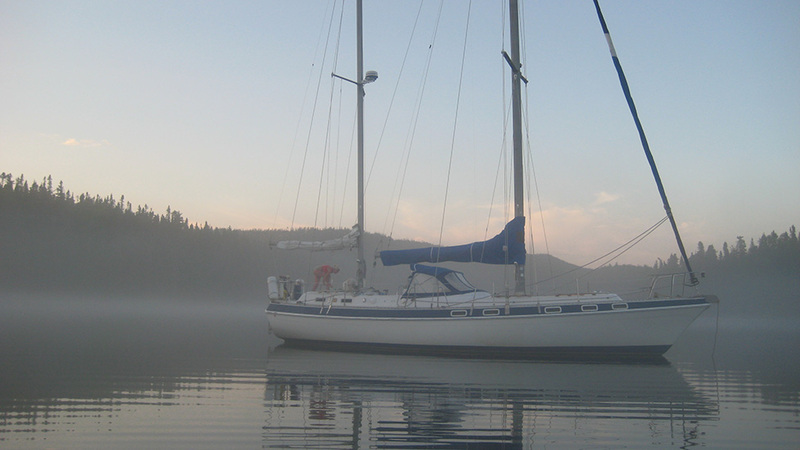 Even the dreaded easterly wind isn’t so bad once the anchor is set and you’re securely nestled among the hills. I recall one particular evening as daylight slowly faded, a thin veil of fog no more than 10-feet thick gradually materialized to form a sheer, translucent veil above the water, enveloping everything in a cocoon of grey. It seemed surreal as the stillness permeated everything. Surprisingly, the temperature didn’t drop and that evening we enjoyed a delicious BBQ on deck in shorts and bikini. The Lion’s Den has just about everything a cruising sailor imagines when they dream about that perfect little hideaway; unrivaled scenery, quiet, good holding, plenty of interesting spots to explore and free seafood for the taking — mussel beds are abundant. 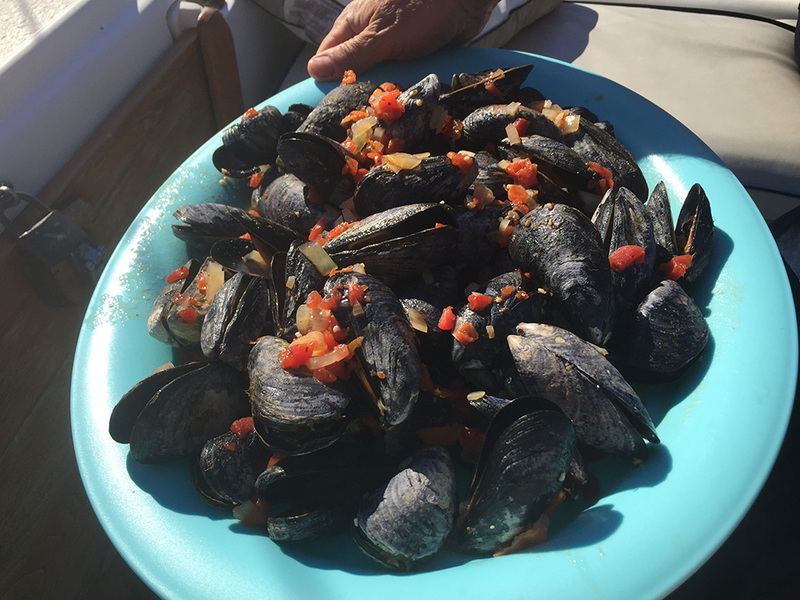 The thought of a big plate of deviled mussels reminds me of….’Beep, beep, beep’…my mental holiday ends abruptly. No Replies to "Into the Lion's Den"